Appraoch to Eagle Mount, round Jakko, Simla. bl.uk > Online Gallery Home	> Online exhibitions	> Asia, Pacific and Africa Collections	> Appraoch to Eagle Mount, round Jakko, Simla. 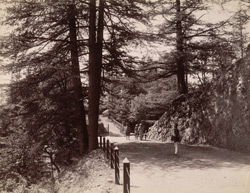 Photograph with a view near Simla (Shimla), Himachal Pradesh, taken by an unknown photographer in the 1880s, part of the Bellew Collection of Architectural Views. Simla in the Himalayan foothills was originally a small village named after the goddess Shamla Devi, an incarnation of Kali. When the British discovered it in 1819, they developed it as a summer refuge from the hot plains of India, and a place of recuperation for battle-weary soldiers. Jakhu Hill, the tallest point near the town, is associated by Hindus with the mythology of Hanuman to whom the local temple is dedicated. At 2,455 metres tall, the hill provides fine views of the town and valley.